When I joined Tyro Payments, they were transitioning from payments provider to full fledged bank. I was hired to work on the new lending offering. It was clear to me that we did not have a deep understanding of our target customer. The customer was described as an existing user of the payments product, often referred to as “the merchant”. Our payments merchants, however, are extremely diverse, covering a wide range of industries and sizes. I knew that for the initial offering to be successful, we needed to tailor the lending offering to specific customer needs. I set out to conduct discovery research into merchants that would help us find our target customer and understand their goals and needs. Due to confidentiality, I cannot post detailed findings or deliverables online. I set out recruiting participants by using leads who were interested in our pilot offering. I made sure to select participants that were from industries that were representative of our merchant base, including medical, restaurants, beauty, cafes, specialty stores, and newsagents. It was important to manage their expectations and frame research as learning about their processes and needs so that we can improve our service, so they didn’t feel they were being sold to, evaluated, or that there would be any guarantee of service. I developed an interview plan with the goal identifying the types of merchants we should focus on, understanding the ways manage and plan their business over time, and test assumptions about merchant's experiences and attitudes toward lending products in the current market. While interviewing, I made sure to start out with broader questions that delved into the merchant's reasons for founding a business, how their business has grown and developed, and the challenges they have faced along the way. It was also important to understand the unique cash flow issues of each industry and business model to understand the job of funding in their situation. I also learned about the challenges they had faced with funding in the past, to understand the pain points that were driving them away from existing products. I used affinity mapping to begin the analysis process. Using both my own research sessions and previous research session documentation, I broke up quotes from each research session and put them on different colored stickies for different verticals. I also labeled each with the participant. I grouped similar statements and then categorized them. I also had colleagues create their own mappings so that I could get different perspectives. I noticed that there were strong patterns correlating with industry and business size, which I broke into different customer segments. 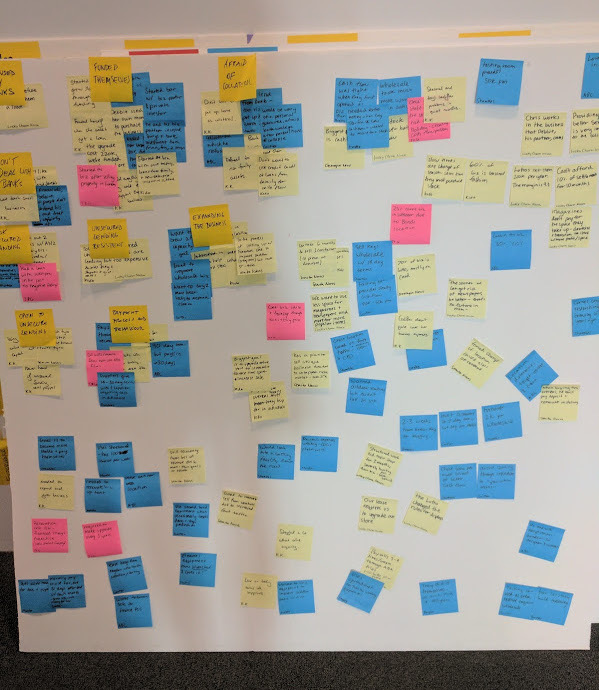 From this I was able to identify the customer segments whose needs mapped most closely to our proposed product offering. Once I had mapped and analyzed my research, I began collaborating with another designer, JT, who had conducted research into accounting and bill payment workflows. By comparing the participants of his research, we found that the different workflows he had identified mapped to the customer segments from my research. 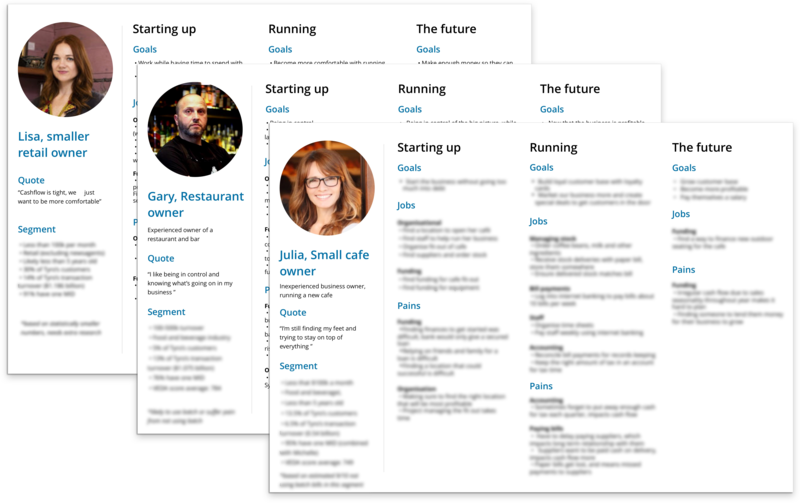 Together we combined our research projects into 6 personas that described Tyro merchants. We then cross referenced our segment criteria with our merchant database, to size each persona in terms of number of merchants and revenue. I continually shared my findings with my team, including the product owners, developers and engineers. I also presented the personas to the design team, and shared them with marketing. I was able to explain which segments were our target customers that we should focus on, why, and how the customer was likely to use the product. These findings drove product and marketing strategy, and allowed us to find gaps in our product offering.